This structure was found to contain three separate rooms and Room 2 contained a large bench that housed multiple human burials. After first documenting and then removing the bench, Burials 53 and 54 were discovered. Burial 53 was interred under the second floor (under the bench) in a cut in the floor. Burial 54 was an adult female with pronounced cranial modification who was laid directly on the floor. Room 1 also contained multiple burials. Burials 49, 50, and 51, were buried under the floor and about half a metre above the prehistoric ground surface (see photo below). This overall burial pattern is very common at Nojol Nah; it seems that the household grew in effect by adding the remains of venerated ancestors to the household population of living people. After all, if these buildings were elite residences, then their “eliteness” would only be diluted by adding more of the living. As important people died, they were kept in the house and as time went on more and more ancestors would be under the floors and benches of the buildings. As more deceased were incorporated into the house, the living people increasingly strengthened their ties to the land strongly establishing their ownership of the property. Termination deposits are well documented throughout the Maya region and are thought to represent ceremonies associated with the abandonment of elite residences. Ritual centered around the construction and abandonment of houses were ubiquitous in the pre-Columbian Americas; in the US southwest, kivas were intentionally burned prior to abandonment, as were house mounds of the Hopewell in the Midwest. The Maya, when abandoning a residence, smashed and stashed important artefacts along the walls. The Courtyard B termination deposit was located along the west wall lying directly on the floor of the courtyard and contained several exotic artefacts. The deposit included two chert bifaces. The craftsmanship and lack of breaks in these two knives strongly suggests that they were intentionally placed. Other significant objects included in the deposit was an antler tine that was sharpened into a needle/awl, and a complete jaguar canine pendant. Jaguar tooth pendant found in termination deposit. Further work at Nojol Nah and El Palacio will almost certainly lead to the discovery of more burials. The long term goals of the Maya Research Program are to build a paleodemographic profile of the inhabitants, further elucidate their mortuary practices, conduct geomorphological investigations in and around the site, and use stable isotope geochemical techniques in order to understand more about migration patterns and climate. 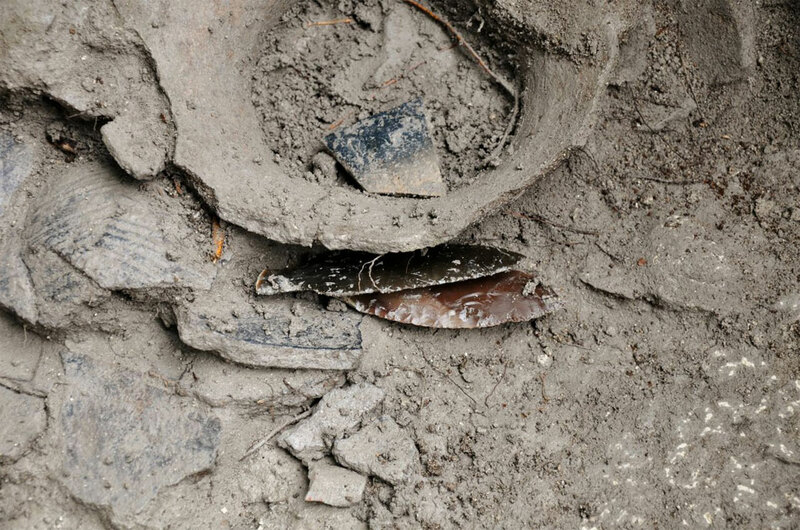 All archaeological assemblages are unique but the work being done at the site is yielding quantities and types of information that are rarely recovered from Maya sites. Through meticulous and systematic excavation of these households, valuable data is being recovered on Maya subsistence, demographics, and ideology. The next few seasons at El Palacio are going to be exciting and ground breaking. The Maya Research Program is a US-based non-profit organisation (501c3) that sponsors archaeological and ethnographic research in Middle America. Each summer since 1992, we have sponsored archaeological fieldwork at the ancient Maya sites of Blue Creek, Nojol Nah, Xnoha, and Grey Fox in northwestern Belize. In 2013 we again offer opportunities to participate in our field program and learn about the Maya of the past and today. The Blue Creek project is open to student and non-student participants, regardless of experience. The field school is certified by the Register of Professional Archaeologists and participants will receive training in archaeological field and laboratory techniques. Academic credit and scholarships are available.